· Exact replacement for Syma X5, X5C, X5SC, X5C-1, X5SW and Cheerson CX-30W RC Drum Quadcopter, no modification required. · Battery size: 0.88 * 2.44 * 4.3cm, Battery weight: 18.1g. · Charger input voltage: DC 5V; Output voltage: DC 4.2V; Battery charge 4 at a time, over charge protection, short circuit protection. · Package includes: 5pcs Powerextra 3.7V 600mAh LIPO battery, 1 * 5-in-1 charger. 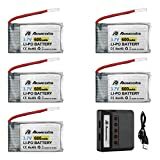 · 5Pcs 3.7V 600mAh 25C Lipo Batteries for Syma X5, X5C, X5SC, X5C-1, X5SW and Cheerson CX-30W RC Quadcopters.Battery Features: Capacity: 600mAh Voltage: 3.7V Battery Weight: 0.63ozRetail Package includes: 5x3.7V 600mAh LiPo Rechargeable Battery Replacement, No Modification Required! 1 x 5 port chargerCompatible with these models: Syma X5, X5C, X5SC, X5C-1, X5SW and Cheerson CX-30W Smart 5-port charger for 3.7V RC lithium batteries Charge 5 packs at the same time Overload protection Short circuit protection Lightweight and super easy to useCharger specifications: Input: DC 5V Output: DC 4.2 V Size: 0.88 x 2.44x 4.3cm Weight: 18.1g (excluding wires and package) Compatible with most Molex Plug RC Helicopter & Airplane 1Batteries LED Status: Red Lights On: Currently Charging Red Lights Off: Full ChargeReplacement: 1) Please make sure the battery size is suitable for your Drone before buying! 2) When receiving it, please double check if the battery inflated up. If you inflated up, to stop using or charging, and contact us on time.3) Do not overload or discharge the batteries.4) Do not charge the batteries still hot or could cause a fire or explosion. A fire retardant safety bag is recommended for storage / charging of lipo battery.